Quite possibly the best and most renown fighter of all the schools is a red haired girl, solely referred to as the Red Lion. But as the Red Lion suddenly disappears one day, we find that's only the beginning to the trials of real "Red Lion." This was a wonderful story. It had a very simple plot to follow, and had a mazing character development. I think that anyone who is looking for a medium length manhwa, involving an innocent first love but also a hefty dose of action and suspense will love this. It is very beautifully drawn (the scanlation is very good) and every single page will leave you wanting to know how things will play out. Red Lion has got to be one of the silliest things I've read so far. It's ridiculous how all of the guys fall for this kind of protagonist. Meet Eisul, the strongest girl ever and someone who speaks her mind. She stands up for people, a tad heroic. She moves to a new place to rid of her past name the 'Red Lion.' People from her past show up to ask her for help; everything turns out all right as she always beats down the people who have some sort of ill-will against her. Many guys fall for her. 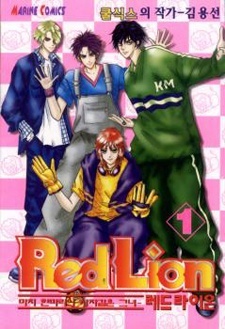 Her secret of 'Red Lion' is still disclosed even though people have seen her get into many fights and other boys mentioning that name. The manga isn't anything special; it's cliche. But I guess it is refreshing to see a girl who isn't a damsel in distress. In addition, a part that was annoying to see was that there was no character development too. I mean the guys who Eisul have rejected constantly come back proclaiming their love for her, even at the end it's like that. The ending didn't even seem like an ending to me. It was truly open-ended. Throughout the manga I was waiting for a 'true' problem. What I mean by a true problem is one that would have a guy completely beat her and she'd have to train or admit defeat. She NEVER lost in any fight even if it was like 1v30+. So yes that kind of problem never happened and the only time when she needs a guy to save her, he's conveniently there and the only reason why she needs help is when she's asleep or rendered useless from using her arms/legs. The art is okay. It doesn't hurt the eyes or make you get excited. Although, it's troubling when there are three characters that look really similar to each other. The only thing I find redeeming about this manga is that you can read this quickly as things happen really suddenly and if an event occurs it's in the span of two chapters. I got some enjoyment even if I've seen ideas that have gotten used tons of times (besides the one mentioned above, there's the whole 'oh-no I killed my best friend, everyone hates me!). I suggest reading if you are like me, who writes this in a lot of my manga reviews, who wants to pass the time and does not necessarily mind reading something that's been done before. I like it when the girl is in charge of the relationship. It's not to short or too long. It doesn't drag at all. There isn't anything too shocking to make you stop reading in disbelief. It flows well from each scene. Definitely good!!! I recommend this. but you shouldn't read it it if you just read one of the same sort. Cause you might get bored. So I read Red Lion just now and since I can neither agree with the existing reviews nor disagree I decided to write my own. I haven't read much manhwa up till now so this might be just my imagination but I believe that those labelled with Romance & Shoujo tend to have a lot of similarities. But I don't think that that's something bad. You usually get a head-strong female lead, in this case it's a fist-strong one aswell~ &I like that kinda Character. The Story wasn't outstanding but nice. The Characters are usual but likeable. and some of them have -uhm--- to less appearance? They could have been worked out way better then they were but I suppose it would have stretched the whole manhwa. So it's fine this way. I won't judge the Art. I mean I personally do, but I won't do it for the review because that's something waaaayyyy to subjective to describe &there are people who tend to say that the Art is the most important part - but I don't think so. So lets leave that be. Well I enjoyed Red Lion pretty much because I like strong female leads & gang fights. If you're not a picky reader you'll be able to enjoy the manwha. Though if you just read some of the same 'plot-style' you'll be probably bored. Ah! That's why we don't have a Ending section --- I see. I liked it~ especially the nickname. "Red Lion" sounds good.